Linde E20 to E35 electric trucks with a load capacity of 2.0 to 3.5 tonnes are among the best-selling electric forklifts in Europe. Overhead tilt cylinders are one specific feature of these trucks. Manufacturer Linde Material Handling is now using this technical advantage in a new, revolutionary truck concept. Designed without the A pillar and available with an optional overhead safety glass guard, the new Linde Roadster with models Linde E20R to E35R offers the driver a unique view of the driving path and surroundings, thus providing additional safety benefits. Motorists would have a much better view of the traffic and their vicinity, were it not for the lateral cross beams of the A-pillar. This used to be quite similar in the world of industrial trucks, but Linde is now changing all this with its new Roadster solution. To this end, the manufacturer is making creative use of a unique design feature of its vehicles. Overhead tilt cylinders absorb the forces acting on the mast during operation and direct them backwards via the overhead guard frame. This eliminates the need for an A-pillar. 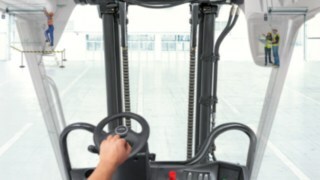 A curved steel tube behind the steering column and dashboard serves as boarding aid and allows the attachment of optional equipment such as terminal, display for the Linde Safety Pilot assistance system, clipboard or mobile phone. Designed without the A pillar the new Linde Roadster with models Linde E20R to E35R offers the driver a unique view, thus providing additional safety benefits. Since an unobstructed view for the driver is an essential factor for passive safety in forklifts, the new Linde Roadster trucks basically offer advantages for all conceivable applications, but especially where an optimum field of view is particularly important. This applies, for example, to applications in logistics and industrial facilities with heavy passenger traffic. Due to the removal of the A-pillar, the field of view is significantly increased so that people or objects in the driving path, both close by and further away, can be spotted early on and the driver can react accordingly. To fully exploit the advantages of the concept, the new vehicles are suited in particular for indoor use, since cabins, doors or heating are not required here. Many comfort features requiring a holding device, such as the Linde Safety Pilot display, mobile phone or clipboard are available to the driver nevertheless at other positions. 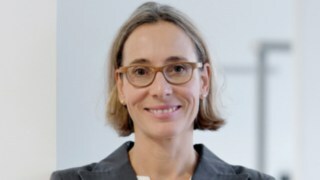 In addition, Linde also offers additional equipment options. These include, for example, a frameless windshield, which is also made of safety glass, and a frameless rear window. 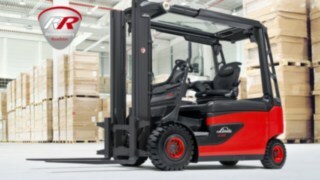 The Linde Roadster is now available for all Linde E20 to E35 series forklift trucks. The basic technical and performance characteristics are fully compliant with the basic models. For instance, the Roadster also offers important features such as dual pedal control, Linde Load Control or the compact axle with dual-motor front wheel drive. The revolutionary roadster models were presented for the first time as part of the World of Material Handling in Offenbach in May 2016.